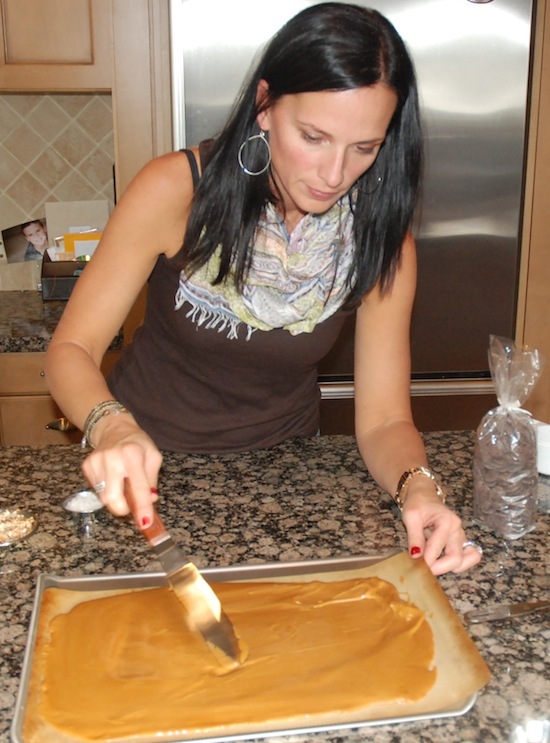 One of my new favorites of this Christmas season is a Butter Toffee Recipe i came across on a site i’ve talked about before: Pioneer Woman . ps..if you haven’t checked out this website, you’re missing out. Tried and true recipes that are do-able are what make this a regular read!! I decided i wanted to demo this recipe at our Lepp Farm Market cooking class because i love the idea of giving edible Christmas gifts. Well, if i was going to demo it, i felt i better know it like the back of my hand. Let’s just say my kids have been pretty thrilled to have had a steady supply of fresh butter toffee at their fingertips for the past 6 weeks. I’m happy to say that haven’t tired of it yet either. Our next trip to the dentist is going to be FUN! This recipe is simple. But in saying that, don’t deviate. Stick.to.the.recipe. Candy-making is a little more of a science than my regular method of “eyeballing” and “estimating” ingredients, cook times and the like. 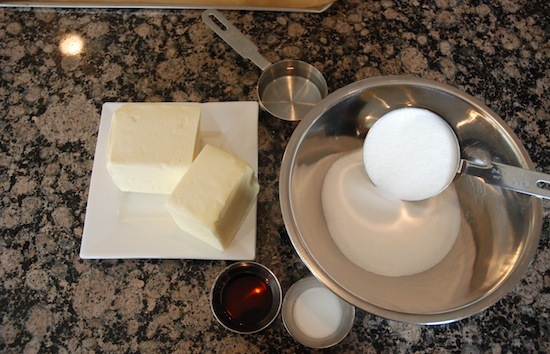 The butter toffee consists of 5 ingredients you most likely have on hand: butter (salted), sugar, water, salt and vanilla. I like to get my toppings ready at the beginning as well. Make sure to use a high quality chocolate. 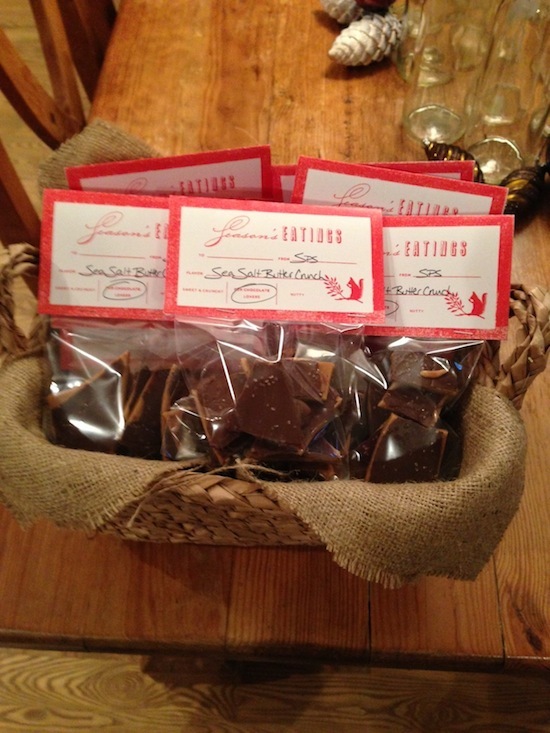 This way you can skip the chocolate tempering step and just melt the yummy chips! 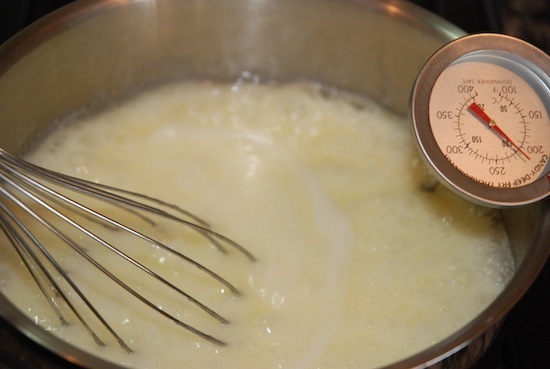 The one piece of equipment you cannot do without is a candy thermometer. And it’s not there to just look all professional….you need to USE IT! I read on one blog that you need to consider the thermometer as your friend! True! Form a relationship..get to know it. Consider it your toffee partner in crime! 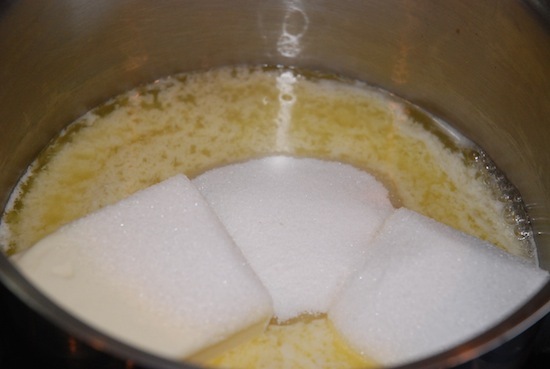 Melt the butter, sugar, water and salt. Start stirring….and don’t stop…not even to go answer the phone. Really.. don’t.stop.stirring .period. As you stir and the temperature rises, you will slowly see the boiling mixture begin to change. It will grow some, so make sure to make it in a large pot. The mixture will turn a rich amber colour shortly after it hits 250-260 degrees. Keep stirring!!! Once my thermometer hits 280 it is literally seconds until it’s done! My sure fire way of testing the toffee to ensure its done is called “staging” Have a bowl of ice cold water on hand. Take a little dollop of the butter toffee mixture and drop into the water. Give it about 30 seconds to set. 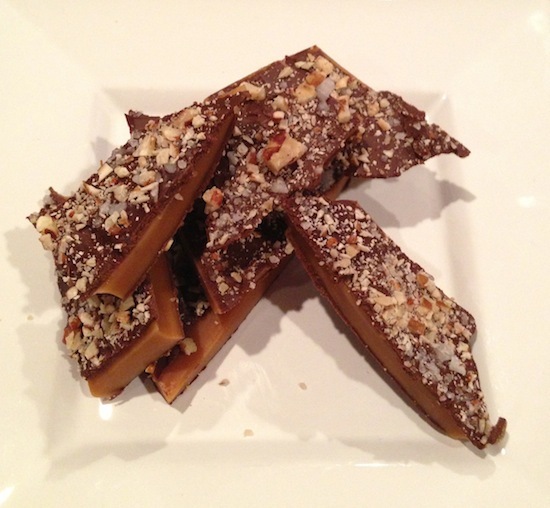 Check the hardened toffee to see if it breaks apart. If it does, remove the pot from the stove. If not, keep stirring!! 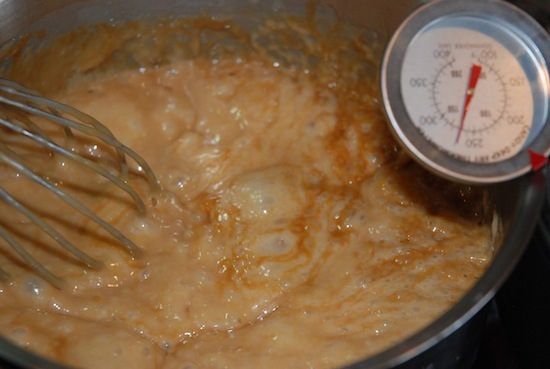 As soon as your toffee is ready, remove from heat and stir in the vanilla. 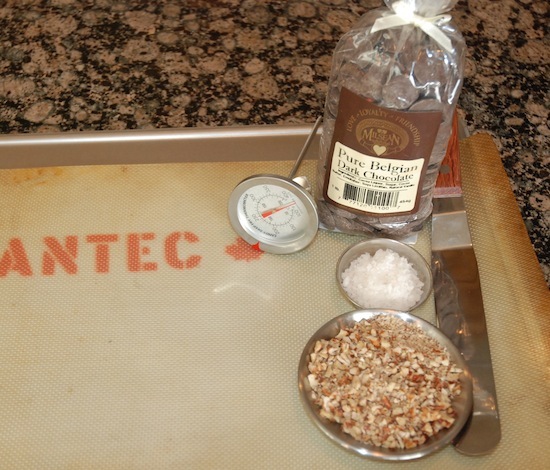 Immediately pour onto a pan covered with a silpat sheet or parchment paper. Spread it right away as this yumminess will begin to harden quickly! What i love is that perfection is not required! Spread it thick or thin..however you like! I place the cookie sheet in the fridge to speed up the hardening/cooling process. 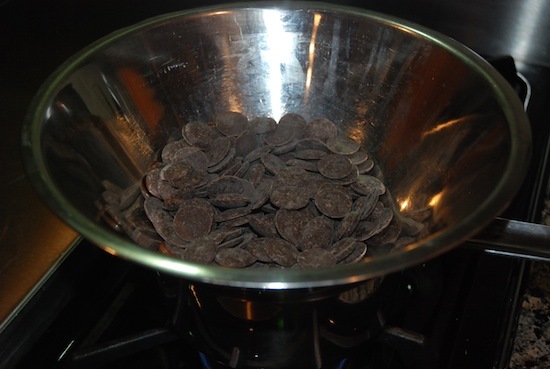 While the toffee is cooling, place your chocolate in a bowl set atop a simmering pot of water. I love how good quality dark chocolate melts so beautifully! Regular chocolate chips just don’t cut it in this application. 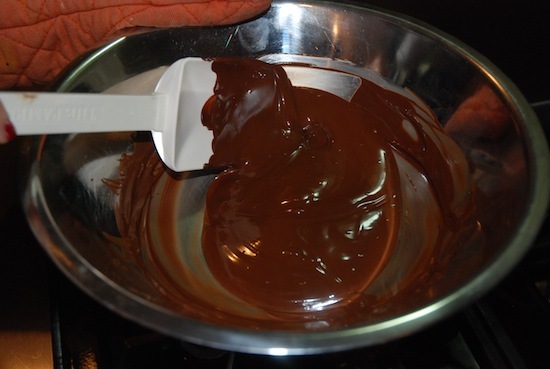 Go for the high quality goods…and you’ll see how glossy and gorgeous melted chocolate can look! My favorite to use is the Milsean Dark Chocolate Callets. Rich Belgium chocolate. I dare you to not dip your finger into the bowl! 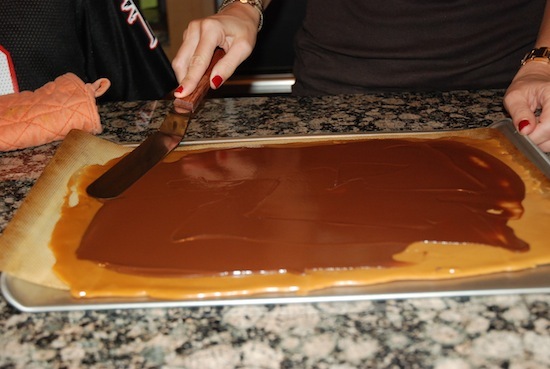 Pour half the melted chocolate onto the butter toffee. Cool again. 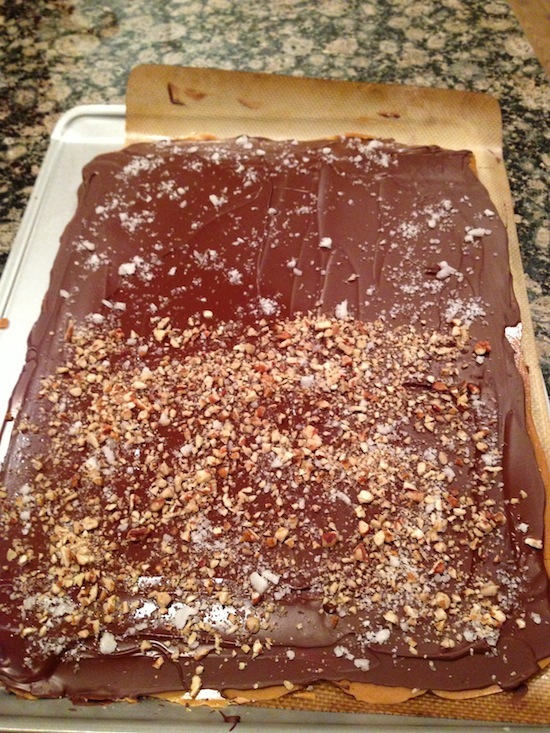 Once hardened, turn the toffee over and spread the remaining chocolate over top. Immediately top with your favourite choices! I topped half with sea salt, and the other half with toasted pecans that were coarsely chopped. 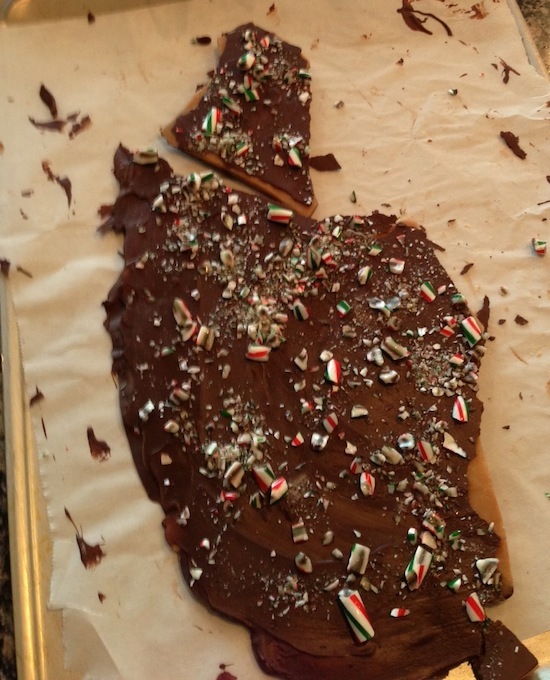 For a sweeter version that definitely encapsulates Christmas, top with crushed candy canes. I had fun wrapping the different types of toffee in cello bags and enclosing with this adorable printed gift topper from Martha Stewart online. Allow toffee to cool completely. Blot to remove excess oil from the surface. Coat surface with half of the melted chocolate. **ps for our local friends, make sure to visit the Milsean Shoppe for their annual Christmas sale which begins this weekend! « Christmas Rose Bud Cookies!